This weekend, Euljiro is holding its own beer festival, offering a beer and nibbles for only 1,000 KRW each. 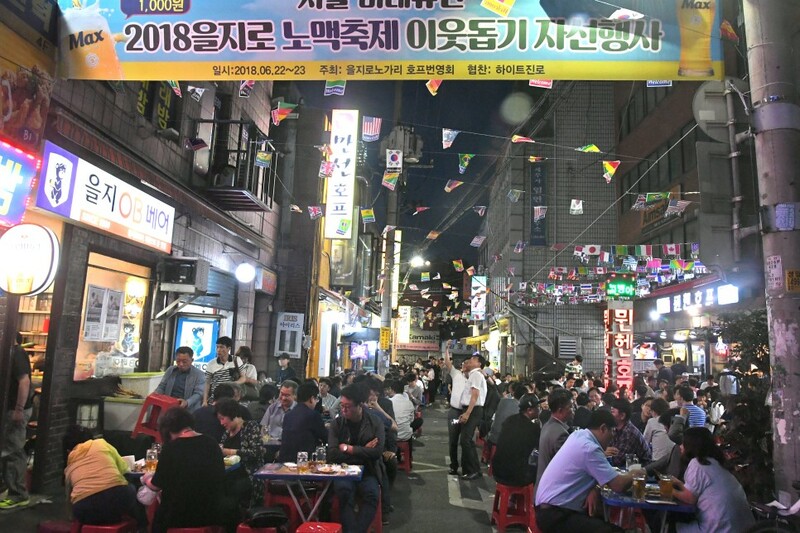 According to Jung-gu Culture & Tourism, 2018 Euljiro Beer Festival will be held at the “Nogari” alley of Euljiro for two days from this Friday, June 22. The district popularly known for its outdoors drinking places offering affordable beer and food, Euljiro 3rd Street has gained its nickname, “Nogari Alley,” from the Korean name for dried pollock, which is the most commonly served nibble here. Celebrating its 4th anniversary, the beer festival will be held both indoors and outdoors of 16 participating pubs located in the area. The Euljiro Beer Festival is the perfect opportunity to experience Korean-style outdoor drinking culture, with humble snacks and beer or soju. Especially with the sponsorship from Hite, visitors can enjoy a glass of beer for 1,000 KRW (approximately $1). Considering its regular price that ranges from 3,500 to 4,000 KRW, you can enjoy four glasses for the price for one. Affordable drinking snacks like dried pollock will be available as well. 2018 Euljiro Beer Festival will be held at Euljiro 3rd Street on June 22 and 23, from 5 PM to 10 PM.